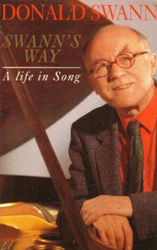 In his 1991 autobiography, Swann's Way, the composer Donald Swann takes the time to say a few kind words about collaborating with Henry Reed. Swann composed and conducted the music for all the radio plays in Reed's (in)famous Hilda Tablet saga, beginning with A Very Great Man Indeed in 1953, through Musique Discrète in 1959, seven plays in all. Swann and his musical partner, Michael Flanders, even had on-air cameos as a Russian interrogators in Not a Drum Was Heard: The War Memoirs of General Gland. It's time I mentioned my work with Henry Reed. He's known to many as a poet, particularly a very fine war poet — many will remember 'Naming Of Parts' , and 'Unarmed Combat', I'm sure. As well as being a fine poet, he had a true gift for radio. He was commissioned by Douglas Cleverdon in the mid fifties to write a series of features for the Third Programme. It is important to say something about Douglas, a gentlemanly, witty and extremely literate book publisher and radio producer, to whom respects and tributes have recently been pouring in after his death. Having published David Jones, and commissioned Dylan Thomas to write Under Milk Wood for radio, he had a similar galvanising effect on the poet Henry Reed and on all of us who worked for him. For many, he enshrined the very epitome of the Third Programme, now Radio 3. The series of seven features Henry and Douglas collaborated on arose from a putative biography of a man called Richard Shewin, which included a cast of some fifteen characters connected with his life. Each feature presented a new development of this satirical and often very erudite story. One of the characters was a 'composeress' called Hilda Tablet. She was a bit of a send-up of Elizabeth Lutyens and, although a female character, of Benjamin Britten. Mary O'Farrell played Hilda Tablet and I was given the chance of 'realising' Hilda's music. Eventually, she nearly hijacked the whole series. She was an eccentric character who always wore tails for her main concerts. Henry got very keen on her and wrote another feature called The Private Life of Hilda Tablet. I wrote and played songs and piano music for the radio series, but when Hilda Tablet composed an all-woman opera at Covent Garden called Emily Butter, I actually chalked up about twenty minutes of an operatic score. I did have a few problems with the music: Hilda Tablet wrote largely twelve-tone music, and I experienced some difficulty writing an atonal and twelve-tone score. Henry was most obliging and altered the story so that in the middle of this purported Covent Garden opera, the Consolidated Musicians' Union goes on strike, therefore leaving nothing but one piano. This suited me fine and the actors began to sing very melodic music because they couldn't stand Hilda Tablet anyway. He arranged it so that I could get back to my comfortable middlebrow style. This was a very fruitful episode for me and it has been a lasting experience. We were treated with the greatest respect by the BBC and there were constant repeats of the series. Humphrey Carpenter has revived it at a recent Cheltenham Literary Festival. I used to beseech Henry to stop writing for radio and write a really good libretto for a musical. If anyone could do it, it would be him. But he loved broadcasting and I can understand this because there is something about radio which is quite different from the theatre. I'm just incredibly pleased that I had such a good collaboration. As well as the pleasure of working with such an outstanding cast of actors, it brought me through to the point where I had explored all that I could do with that imitative style.